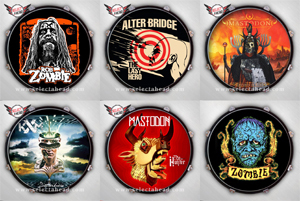 Select-A-Head, LLC is pleased to announce a new reduced pricing for their popular 22” pieces of drum wall art. The new pricing comes just in time as the Seattle-based company has also established new partnerships with music and horror visionary ROB ZOMBIE, acclaimed hard rock band ALTER BRIDGE, metal juggernauts MASTODON and supergroup KXM. These partnerships will join the already impressive lineup of designs created for IRON MAIDEN, MOTORHEAD, GODSMACK and QUEENSRYCHE to name a few. All designs are available at www.selectahead.com for the new low price of $115 + shipping. All Select-A-Head purchases come with a 100% satisfaction money-back guarantee. On the heels of the company’s launch in winter 2014, Select-A-Head has been working tirelessly to refine the process these beautiful pieces of art are created. Now holders of the patent design, Select-A-Head, LLC looks to expand the line in various avenues. Aside from establishing numerous musical partnerships with more to be announced soon, they have already created designs for colleges such as Central Washington University, Gonzaga, Ohio State and others with new Universities being solicited all the time. These unique displays were the creation of Seattle entrepreneur Steven Kenkman. He, alongside his brother, created the design that in some select instances come autographed by the artist when available. The process starts with a 22 inch 4 Ply drum shell wrapped in black PVC for durability; black die cast metal hoops; chrome lugs and claws with rubber gaskets to help prevent scratching and the images are printed on a high-quality matte finish. These designs have caught the attention of some of music’s biggest stars including Ray Luzier (Korn/KXM), Nicko McBrain (Iron Maiden), Eddie Trunk and countless others.